BikeRegister, the UK’s national cycle database, is partnering with bike storage specialists Cyclepods Ltd to reduce bike crime at rail stations across the UK. The statistics for bike crime are highest at rail stations, where bikes are often left all day while commuters go to work. British Transport Police recently revealed that a total of more than £1.5 million of bicycles were stolen from railway stations in 2014, equating to 14 bikes being stolen from stations every day. Cyclepods have been working with National Rail networks since their inception in 2007. From traditional stands to their Easylift+ solutions to state-of-the-art Cycle Hubs, the company has installed nearly 5,000 spaces across the UK rail network. 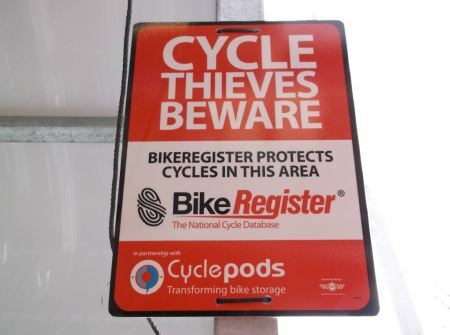 The new partnership with BikeRegister will introduce crime deterrents including warning signage across existing and future Cyclepods (http://www.cyclepods.co.uk) bike parking installations. The signs warn thieves that the bikes stored are protected by BikeRegister and also advertise free BikeRegister registration for cyclists who have not yet signed up to the UK-wide scheme. So how does BikeRegister work? BikeRegister (http://www.bikeregister.com) is the UK’s national cycle database whose key aim is to protect cyclists against bike theft. By registering your bike for free with BikeRegister, you have access to a number of great benefits which all work towards making your bike less of a target to potential thieves. Which means that if your bike is stolen, you can flag it as such on the Bike Register website and will have sufficient information to provide to the Police for them to keep a look out for your bike. It also helps in getting your bike returned to you once stolen. Further steps to protect your bike can then be taken by using BikeRegister permanent bike marking kits, available to purchase from their online shop.